As this is a quick review, let's get straight into the meat. What I liked the most was the way that Gojko uses a simple mind-map approach to try to see the "whole" of the system. If you have followed this blog you know that I consider myself what some people would call a Systems Thinker (although I like to call it "In search of the hidden connections"). 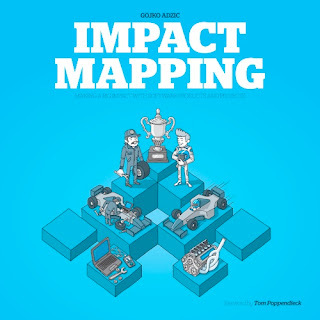 What I see is that this practice of Impact Mapping has the potential to help many teams finally implement a systems thinking tool when describing the systems under development. The book is also filled with suggestions on how to facilitate Impact Mapping in practice. This is a light-read section of the book, filled with detailed advice and some anecdotes that Gojko shares in the hope that it will help you get started with the method. But perhaps the key value I take out of this book is the neat way in which it fits between two tools that I've used in the past: The Business Model Canvas, and the Build-Measure-Learn cycle from #LeanStartup. In fact, I believe that Impact Mapping is a very interesting tool that can generate the insights from the Business Model Canvas and directly translate them into a product design and later into experiments. As I read the book, I felt intuitively more comfortable than when reading and practicing Story Mapping. However, this is only an assumption that I will have to test soon. How about you? Have you read the book? Have you used the practice? Share your experiences with the technique in the comments. I'm interested in learning more about how the practice is used in real-life projects.